Langkawi is all about the beach. 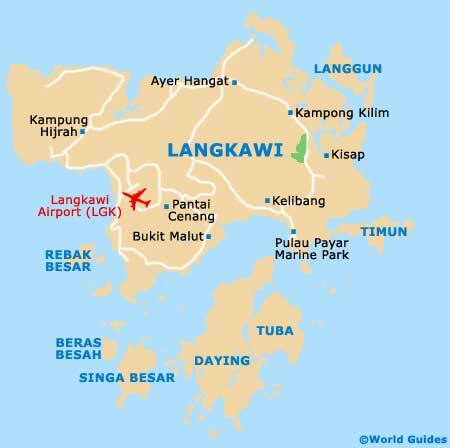 While there are some 100 islands in the chain, with most of them having beaches, the main Langkawi Island is widely considered to have the best coastline and related attractions. Pantai Cenang (Cenang Beach) in the south-west is the most popular and is one of powdery sand and seafood restaurants. Cenang offers a large choice of accommodation, resorts and various water sports, although if you are going for a swim, do watch out for jellyfish. Stretching for approximately 2 km / 1.5 miles, the beach of Pantai Cenang lies around 25 km / 16 miles west of Kuah and is lined with palm trees. In November, December and January, the low tide exposes a sandbar which links the neighbouring island of Pulau Rebak Kecil. Pantai Tengah is not far from Pantai Cenang and is more tranquil, with smarter accommodation, while Pantai Kok is rather more isolated in west Langkawi, and simply stunning. The Telaga Habour Park is a highlight here and this marina is a good spot for yachting. Tanjung Rhu in the north has many secluded sandy beaches, Datai Bay has the top-end resorts, and Burau Bay is one of rocky outcrops. For some of Malaysia's best scuba diving, take a trip to the Pulau Payar Marine Park and enjoy the spectacular underwater coral scenery.